One of the many diagrams used in coaching sessions. 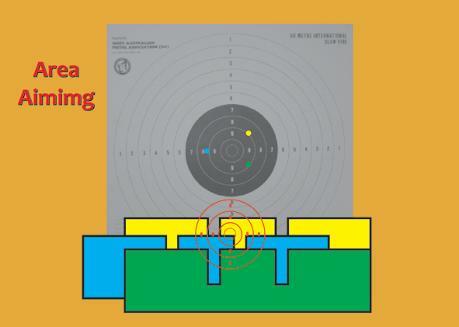 This shows area aiming with shot placements provided sights are aligned correctly and the shooter has a smooth trigger press. This ties in with the article below. Often shooters find themselves with a perfect sight picture and fire the shot only to scope it and find it is nowhere they thought it would be. They were certain the sights were aligned and in the “right spot” to shoot a ten. But wait.............it's nowhere near the ten ring! What generally happens is the mind say’s everything is 'ok' so press the trigger NOW! To overcome this one must combine trigger press and sighting at the same time. As the sights are aligned and all is ready for that perfect shot, the conscious mind takes over and makes the trigger finger move and the time delay in all this happening causes the trigger press to be a violent movement rather than a gentle consistent pressure being applied until the shot breaks. Lets look at setting up a precision shot. Raise the pistol above the target and have the sights roughly aligned so that you are seeing the back of the hand, the sights, your shirt sleeve etc. At this stage you are not really focusing on any one particular “thing” but seeing everything in a picture like 'frame'. Lower the pistol so that it enters the target in a straight line and slows as it goes through the black and finds the area under the black that you normally hold in. As the sights are coming through the target, increase your focus of attention onto the sights and this will actually slow the pistol’s movement through the black. When the sights are in “your” area, be sure you are ready to fire the shot. This is the stage I like to call it ”settling”. It may only take a second or two but at this point you have a choice to continue or cancel the shot. If something looks or feels wrong, then cancel the shot and start over. The setting up of the shot is most important. At this stage all focus should be upon the front sight and its alignment. During this “intense” focus, the trigger is being pressed whilst the sights are being aligned within your area of hold. This is the most critical part of any shot that the sighting and trigger press is being combined. This can be practiced with dry fire or live fire onto the back of a target (blank card) or even just shots into the target butts. With time, the trigger press will become a sub-conscious reflex action. The most difficult aspect is to gain enough self confidence in your ability to hold the sights aligned whilst pressing the trigger. Achieve this and you will be surprised at the results.